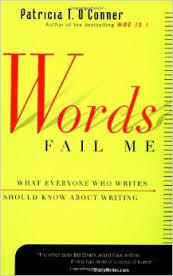 Words Fail Me: What Everyone Who Writes Should Know About Writing, Patricia O’Conner, Mariner Books, 2000 (c1999), ISBN 978-156010870, 240pp. It’s one of life’s little ironies that you find yourself engaging in things as you grow older that you hated when you were younger. Maybe hate is too strong a word. It wasn’t that I hated grammar, but that I really didn’t give it much thought, and felt that time spent in English class doing so was wasted. Since then, I’ve become not just a writer who wants to be read, but also a teacher of writing, who has to convince his students that grammar is important. Having resources like this book by O’Conner certainly helps. Rather than the dry stuff foisted off on middle- and high-school students, O’Conner leads through examples. This is a nice companion to her earlier book, Woe Is I: The Grammarphobe’s Guide to Better English in Plain English, which covers some of the wrong-headed beliefs that most students emerge from secondary school with (such as the incorrect idea that it is wrong to end a sentence with a preposition, which I just did). It’s a good writing book that gets you to thinking it’s time to pick up the pen and write something, and that’s how I felt several times while reading through this one. In fact, her section on point of view “cured” a bit of writer’s block I was having with regard to one story that had been lingering about in my mind for the last four years and which I had been unable to start. I’d be tempted to do away with the writer’s handbook for these two books of O’Conner’s, but that wouldn’t be smart. These are good, but they aren’t a reference so much as they are an explanation for why grammar needs to be observed.